The goal of the Ethical Practices System (EPS) is to uphold the integrity of ethical standards among interpreters. In keeping with that goal, the system includes a comprehensive process whereby complaints of ethical violations can be thoroughly reviewed and resolved through complaint review or mediation. 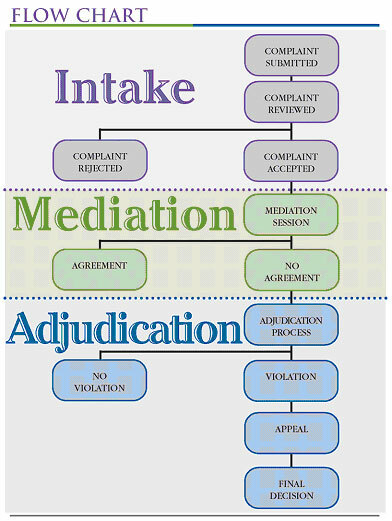 Below is a flow chart as well as a brief description of each step of the complaint review process. This information is available in the full-text of the EPS Policy Manual. A person files a complaint by filling out the Official Complaint Form. The complainant provides information about the interpreter who they are filing against, describes the incident and the alleged misconduct and sites which tenets of the NAD-RID Code of Professional Conduct were violated. In addition, a detailed narrative must accompany the filing form. Each complaint is reviewed, and a determination is made as to whether the complaint will be pursued. Before a case can be accepted, RID Headquarters may request additional information. A complaint may be dismissed if the documentation is incomplete or if the complaint itself is non-actionable, non-substantive or has already been corrected by another means. If a complaint is accepted, the complainant and respondent will receive letters that an official case has been opened. The respondent is asked to submit a written response to the allegations. The response should include a detailed narrative and address each of the violations alleged in the complaint. Mediation is a collaborative problem-solving process that allows the person filing the complaint and the interpreter to discuss a shared conflict and mutually agree upon a resolution. The parties meet with one or two mediators who serve as neutral third parties to facilitate and guide the discussion. Mediation is the first step in the multi-level grievance system. It aims to increase the efficiency with which complaints can be handled as well as restore relationships. The parties may come together and discuss the basis of the complaint and possible ways to resolve it. If so, the parties each agree to follow the terms of the agreement. The hope is that they will clarify any misunderstandings, address the allegations of ethical misconduct and mutually agree on the best course of action to resolve it. The parties may reach an impasse or be unable to find an amicable solution that satisfies both sides. If that is the case, the mediator(s) will close the session and submit the case to the next level, which is adjudication. If a mediation agreement is reached but one or both of the parties does not meet the terms of the agreement, the case moves to adjudication. Adjudication is a peer review process in which a panel of interpreters evaluates evidence of an alleged violation and determines whether the interpreter’s action was in violation of the NAD-RID Code of Professional Conduct. If it is determined that a violation did occur, the panel is further empowered to determine what sanctions should be imposed. The role of the adjudication panel is to review official EPS cases and objectively weigh the issues of the complaint, the response and the supporting evidence. The panel relies on the information provided by the parties to determine the merits of the case, whether the interpreter’s action constitutes a clear ethical breach, and what, if any, sanctions are warranted. After careful review, the adjudication panel reviewing the complaint may find that the interpreter’s behavior is a clear breach of the code. If that is the case, they will make a written declaration with a rationale for their decision. The panel will also decide what the interpreter must do in response to the violation. The decision-making power is in the hands of the panel assigned to the case. After considering the facts and circumstances, the adjudication panel reviewing a case may find that the interpreter’s behavior was not a breach of the code. They may decide that the evidence is inconclusive and render a decision of no violation. It is possible that the interpreter’s behavior is unbecoming of an interpreter, but not an ethical breach against the code of conduct. After a panel of adjudicators render a decision on a case, either party may file an appeal of that decision on the basis of the grounds laid out in the EPS policy manual. If it meets the requirements, a new panel of adjudicators will review the decision of the first panel. In the event that a case is not appealed, the panel’s decision is final. If an appeal is filed and is accepted, the decision will be reviewed, but the appeal panel’s decision is final as it is the last level of appeal in the process.